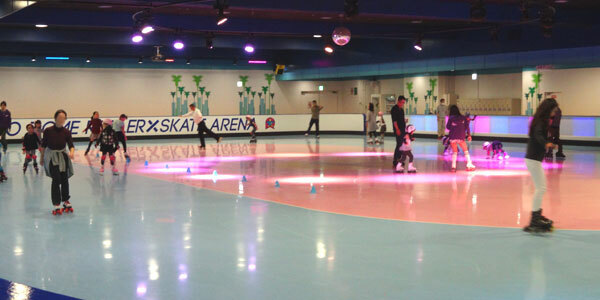 Tokyo Dome City Roller Skate Arena’s recommendation degree is 4.0! Admission fee is necessary regardless of whether or not you are running. Adults are accompanied by elementary school students and below. Just watching. * Extended fee for the same amount also costs when even just seeing. 30 minutes 400 yen. (400 units, 9 units for disabled people). 30 minutes 400 yen. (170 cars, one for disabled people). Roller Skate Arena in Tokyo Dome City is a roller skating rink located in Tokyo Dome City. It is on the 4th floor of the yellow building on the southern side of Tokyo Dome City, near the Suidobashi station. In the yellow building there is also a bowling alley and a batting center, and it is a building that feels like a sports center. There was a story that the competition population increased at a stroke as a result of Mao Asada’s big success at ice skating. On the other hand, roller skating and inline skating are more like leisure than minor competition, sports, but as I actually did it was very refreshing and very enjoyable. I was also fun, because I thought “I should buy shoes …”, I can understand my daughter’s feelings (laugh). Roller Skate Arena has a fixed time. First two hours. After that, an extension fee of 300 yen will be charged every 30 minutes. In the first two hours, the cost is different for adults and children. However, same extra charges will be charged for adults and children alike. In addition, adults who only seeing by child’s attendance .who pay expenses as entrance fee. Whether you do roller skating or not, the fee will be charged equally regardless. Just seeing kids , or bring shoes and skating, without making such a judgment, anyone who enters inside takes the same cost. That is a very simple fee structure. By the way, 2 adults, 1 child, renting shoes, extended for 1 hour and used for 3 hours in total. The total amount will be 7,300 yen, so it is a big expense. In addition, if you go out to eat lunch or night, I will go over 10,000 yen. . . Rental shoes cost 500 yen. This can be used as 1 time regardless of extension charge. Also, if the size does not match, you can exchange, so first try borrowing at the size of the shoe you usually wear. Also, helmets, knee, elbow protectors can be borrowed for free. There are also for adults, so it is safe to borrow those who are first-time experiences. My wife fell down and hit her legs and arms. She felt sick after a few minutes from the pain and sat down in the toilet. . . She also had pain for more than a month, so I do not think there is anything too careful. By the way, the orientation of the wearing protector for this photo is opposite. I attach it so that hands do not hurt when I take hand down. Therefore, it is correct to install so that a hard plate comes to the palm side. Saturday, Sunday and public holidays, free one-point lesson! On Saturdays, Sundays and public holidays, one-point lessons are held free from 11, 13 、15 o’clock. It is a free lesson of about 10 minutes that anyone can join in the center of the arena. Not particularly for children, adults can also participate. Since the announcement starts about 15 minutes ago, it seems like anyone gathers in the center of the arena and waits for the start in accordance with it. A beginner also does not know well how to stand, but it shows how to stand up after sitting, how to fall down, how to walk, how to stop. It is truly an elementary teaching, but I was very thankful as it was my first roller skate for my family. Since I feel that security depends on whether I know this basic behavior or not, I think that the speed of progress will also change, so I think that it is also wise to go along with the time of a one – point lesson. By the way, four times「 one point lesson」ｈad been held also on the day many customers are　coming. Depending on the staff who tells us, its content is different little by little. So I think that it is good to participate in lessons twice, three times. Points are also expensive as well. Some of the staff are also skating inside the arena, they call out to the children periodically and will advise on how to skate. The reason why the staff are skating with customers is that the original purpose is to go immediately to the rescue of injured customers.It seems the children are very happy that the staff speaks to their children. 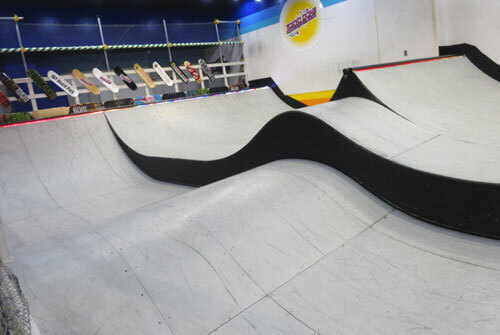 Not only for the roller skating arena, but also for the skateboard lamp (half pipe) is also available. Skateboards can also be rented, and you can also skate with roller skates. Also, there seems to be a lesson for skaing safely. There is also a lesson to slide safely. The daughter of the first grade of elementary school seemed to like very much that it could not get wet even if it fell down. Children often fall, so “It is OK to fall” is very high evaluation point. Well, since it hurts when it falls　down, it does not mean “completely OK if you fall down”. Also, the inside of the arena is not as cold as the ice rink. Even in winter it is OK even with one shirt. Or, as my body gradually gets hotter, I will sweat even one shirt. 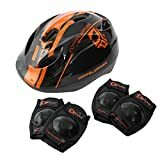 In addition, in the case of children, it seems to be hot as the helmet and protector are worn, so there is excessive heat. Also, it seems that roller skating and inline skating are different. Roller skating with tires on the four corners of the sole has a sense of stability. There is a sense of stability when you stand on one foot, so even people who just started skating can enjoy to slide quickly. Especially for beginners, after wearing shoes it means that they will not be restless until taking off their shoes. There is no way to sit down to stop. Ice skating slides in the link, but it does not slide when coming out of the link, so you can be standing with confidence. But in the case of roller skating you will slide even if you leave the link so you can not have break a bit by leaving the link. .
On the contrary, it is possible to slide relatively freely even in a passage outside the link, so it seemed that advanced level person enjoys including that part. It is a painful situation for beginners. . .
By the way, in the case of a novice male, it is pretty challenging to go to the bathroom while wearing shoes! Even if you stand stably, you may be throbbing, or you will break the balance when you are peeing. . . 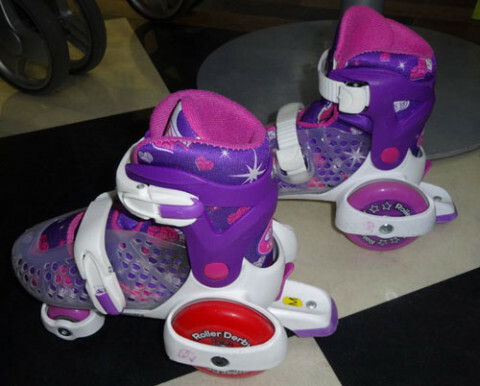 I am a beginner who has neither knowledge nor experience as much as I can write things like the difference between roller skating and ice skating, but what I actually think is that the basic mechanism of sliding on shoes is the same is. There is no big difference just by the difference between sliding on slippery ice, with a tire on the shoes and sliding … · · ·. When comparing inline skating with ice skating, its identity becomes more pronounced. In the case of a roller skate with a tire at the four corners like a car, since it is more stable than an ice skate, will it be easier to challenge than an ice skate. And, both sports have few people to slide. For that reason, there are limited places to slide when actually trying to challenge. And it is also similar that the shops where we can buy tools are limited. In addition, I think that it is fundamentally different, I think that skiing is similar by sliding with weight on each onefoot. A protector is meaningless what it is cheap and bad. 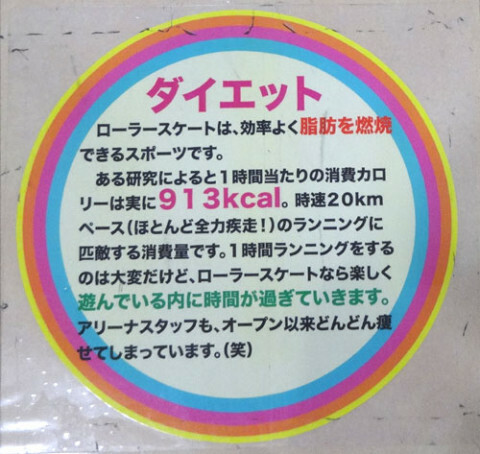 According to the International Roller Skating Association, calorie expenditure of 1 hour seems to be 330 kcal to 590 kcal by roller skating exercise. It was written that it was almost the same as jogging and bicycle. But there were more amazing effects on the Roller Skate It was on the wall of Arena. If a person skates for two hours skating it will exceed the daily calorie intake! Incidentally, in order to increase the diet effect more, it seems to be better to repeat alternating between early slieding and slow sliding every minute. 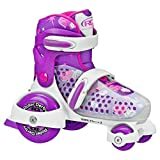 Since I have not exercised at all recently, I think that I should tighten my body with roller skating with a child (laugh). 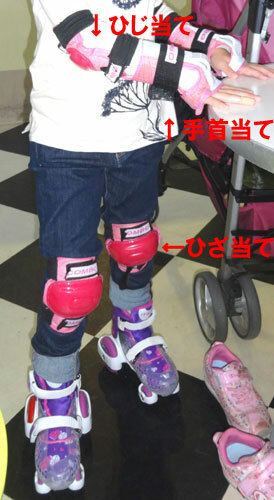 I was totally synchronized with inline skating at the Roller Skate Arena in Tokyo Dome City, I made the following inline skates, roller skating sites! 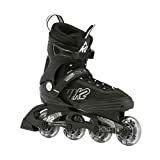 We mainly provide information on places where you can practice and shops where inline skates can be purchased　in Tokyo, so please refer to them .